The female-only meet up is part motivational powwow, part creative performance, part open conversation with like-minded peers. Over the past decade, the boom in women’s meet-ups for every taste and budget has mirrored the growth of woman-owned businesses, with more than 8 million female-led firms nationwide. But many female leaders are looking to make more than merely loose contacts over cocktails; some are seeking meaningful connections, shared interests and lifelong friendships. And that’s why radio producer and journalist Elaine Grant and musician Julie Geller teamed up as the talents behind a new act in town – Setting the Stage. Setting the Stage is a women-only motivaional event with stories and song. Photos by Iris Kosmicki. 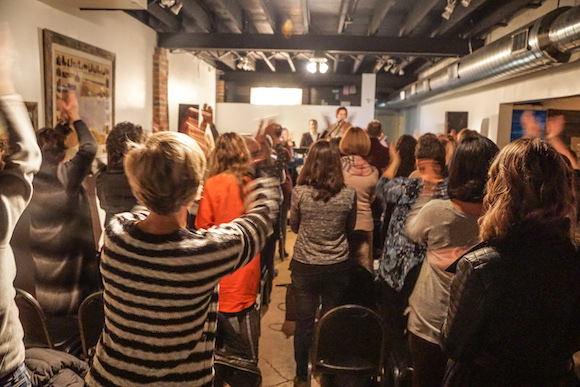 Setting the Stage is designed as an uplifting women’s event and it takes place at Beacons Community Space in the Cherry Creek North neighborhood. The cozy space, with black-and-white wallpaper, exposed brick and a hodgepodge of furniture and equipment, indeed sets the stage for the varied activities and participants. The events —four to-date — draw a collection of 20 to 30 sociable women. 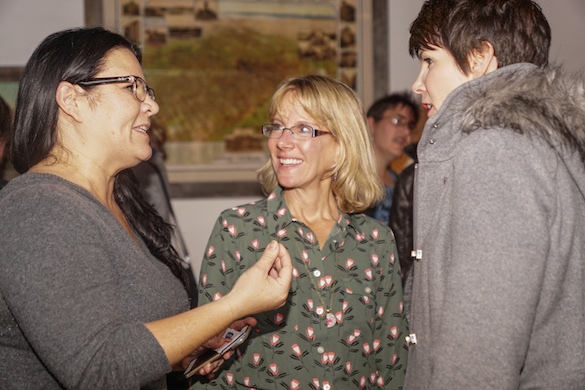 The gender-segregated meet-up isn’t a traditional professional networking group, but instead a “connecting event,” a mixed-activity, community-building workshop: part motivational powwow, part creative performance, part open conversation with like-minded peers. 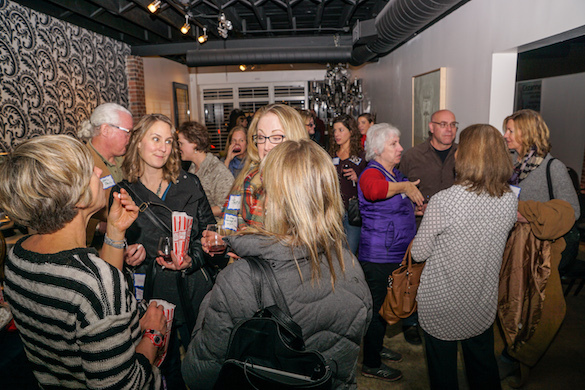 The range of ages spans decades, from millennials to baby boomers, as they arrive dressed down and prepared to mingle, ask questions and share personal anecdotes. Elaine Appletn Grant records her podcast One More Shot live at Setting the Stage. Photos by Iris Kosmicki. So, the evenings start with Geller playing original songs – just her and her guitar – in front of a captive audience. By the final chorus, everyone in the room is singing along. Soon after, Grant does her part with a live interview for a podcast series she calls One More Shot featuring guests who have seized new opportunities and refocused their lives on second careers and adventures. “I’ve always been fascinated with people’s reinvention stories,” says Grant, who makes the podcast available anytime online at onemoreshotpodcast.com. Julie Geller provides the music at Setting the Stage. Photos by Iris Kosmicki. Grant was inspired to launch One More Shot. as a storytelling platform after a happenstance meeting with Kari Knutson, a filmmaker and national speaker who had taken the plunge to pursue her creative dreams after 20 years of excuses. Around the same time, Grant met Geller at last fall’s TEDxCrestmoorPark. The two hit it off and Geller followed up in January, looking for ideas and inspiration for a new monthly women’s event she was in the beginning stages of planning. “We went out for coffee in early January and she asked me for some interviewing tips because she wanted to have a live storytelling component,” Grant recalls. After the twosome got to talking, Geller asked if Grant would want to take on the first go-round of the Q&A. Setting the Stage takes place once a month in Cherry Creek. Photos by Iris Kosmicki. 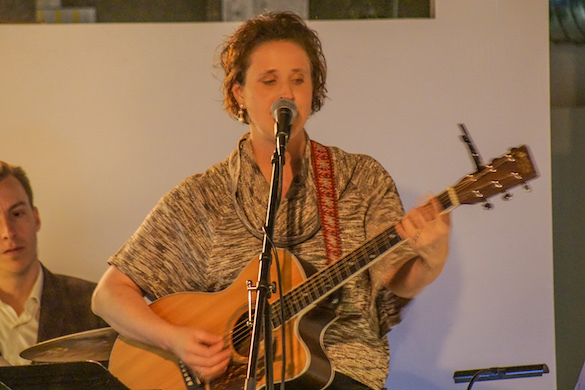 And so, they rounded up Knutson to share her “One More Shot” story – evolving from a mother, school counselor and lecturer to her newfound passion as producer of a theatrical, one-woman show – in Grant’s first live recording at Setting the Stage in January 2017. “It’s been a really good fit,” Grant says of the collaboration, noting that the programming is now operated by four women: herself, Geller, Knutson and Patricia Sandler. Geller’s songs pull it all together. “I am saving the world one song at a time with music that connects people to their best selves and each other,” Geller says. The focus is by no means exclusively business or entrepreneurship, as so many other more formal, female-focused assemblies are. The answers were typical of the kind of rich, constructive and empowering stories that come up at Setting the Stage. Sherri Wigmall, an investment adviser representative at Transamerica Financial Advisors Inc., shared that her divorce was a turning point. With three small children in an unfamiliar setting, she took a stand and refused to return to the comfort of her family’s southern California home, instead, independently working to support her family in Colorado. “I thought I had the fairytale romance,” Wolz says of a two-year, long-distance relationship that went awry. When her relationship turned abusive, she left, recovering by sleeping, reading and bike riding, on repeat, for three months. She logged between 300 and 500 miles a week and, not long after, was introduced to Ride the Divide. “I would like to inspire people to do more of that type of traveling and trust themselves,” Wolz says, tailoring her comments to solo female adventurers. She now plays host on bike trips across the country, one of which Wigmall will be attending toward the end of the summer. Though the next event date has yet-to-be confirmed, looking ahead, the programs will switch from Tuesday evenings to Thursdays, roughly once a month. Find info on the next event at settingthestagenetwork.com. Read more articles by Gigi Sukin. Gigi Sukin is a Denver-based writer-editor. She currently works as an editor at ColoradoBiz and previously worked as an editorial intern at 5280. The street grid Denver was born with in the 1850s became the exception to the rule as the city grew around it in the subsequent decades. The askew layout has both drawbacks and benefits.